This is a really really nice animated movie. The trailer is so good, I can't wait to see the full movie. The film tells the story of an ongoing battle between the forces of good, who keep the natural world alive, and the forces of evil, who wish to destroy it. Read the complete summary of the film after the cut and watch the trailer. 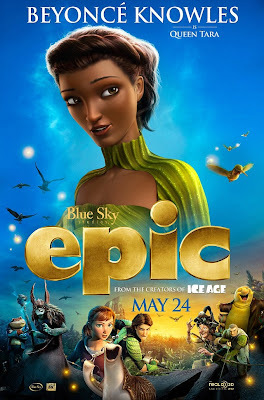 When a teenage girl (Amanda Seyfried) finds herself magically transported into this secret universe, she teams up with an elite band of warriors and a crew of comical, larger-than-life figures, to save their world...and ours. Meanwhile, Beyonce’s character is beautiful, agile and strong, ‘the life force of the forest, which she presides over with respect, compassion and humour’ according to the movie’s website. When Queen Tara finds herself in danger, her unique connection with nature gives her powerful allies. And when all hope seems lost, she summons help from the most surprising of places.